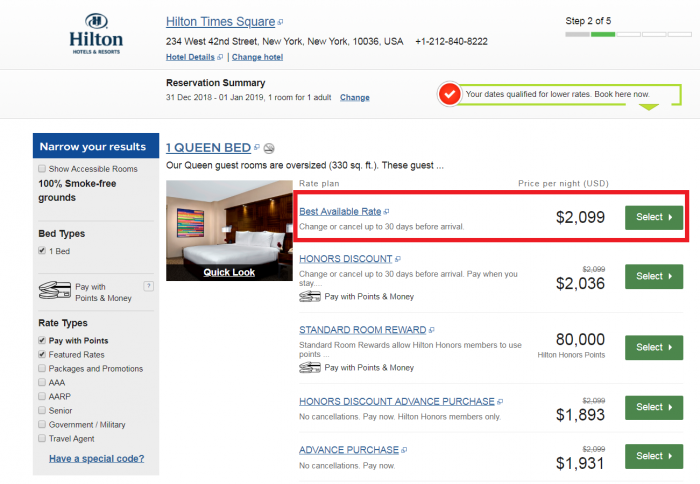 Reader Question: How To Use Hilton’s Be My Guest-Certificate? A LoyaltyLobby reader sent us a question by email about Hilton’s Be My Guest-certificate that you normally receive from corporate if property completely fails to rectify an issue you had. Hi, we’ve been offered a Be my Guest Certificate by Hilton because of we booked a Home2Suites Hotel which they are still building at the nights we booked. Now they offer us a Certificate, but it is very unclear to us how to use it.. They say to use the Easy Cancellation option, which i can’t find anywhere on the Hilton Garden Inn Victorville Site. When i book the hotel, isn’t my CC charged for the full amount? You should have a look at the certificate to see if there are any brand restrictions where it can be used. If there aren’t, I would say that it would be waste to use it for a stay at Hilton Garden Inn where the daily rates must be rather reasonable. Here’s rate display for Hilton Times Square for NYE. The rates are insane. Their Best Available Rate for the standard room is $2,099 for the night. This is the rate that someone having a Be My Guest-certificate should book. This would be perfect use for the certificate and the best part is that you would like earn points based on the underlying rate (at least I have every time). The rate rules here say that they will charge a deposit but they would cancel it and charge it to Hilton’s internal account for these certificates. Note that usually the Best Flexible Rates are not charged in advance. You only need a credit card to guarantee the reservation. I really like these Be My Guest-certificates and offending properties must hate them because they will eventually foot the bill for the hotel night(s). I have used them for the DoubleTree Guest Suites Times Square and Conrad Koh Samui Suites. Both were in excess of $1K per night. You just have to be careful with the brand requirements that the certificate may have. They are usually limited to the brand where you had the issue. Previous articleSwedish Mom Jailed In Dubai For Drinking A Glass Of Wine On Emirates Flight!